We grew together in music, just as we did in life. 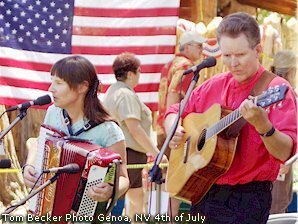 Our music has taken us on many roads, some of them pretty dry and dusty, like when we were the musicians for the Nevada Gunfighters Theatrical Acting Troupe! The Gunfighters have a popular act, and although the bullets were blanks, there's still clouds full of gunpowder, and we sang through it during every show! We called ourselves Slim and Minnie, and even found ourselves on the front page of the Reno Gazette Journal daily paper! 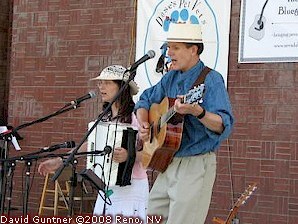 Those were fun times, traveling through Nevada and Northern California for county fairs, Renaissance festivals and contra dance gigs. 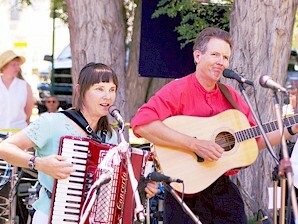 Our musical adventures started as a lark, when one of our friends in the Tahoe Choir said, "Hey kids! 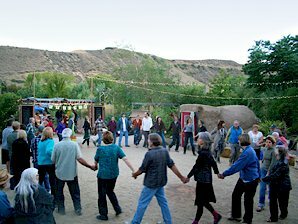 Let's start our own Ren Faire singing group," and soon afterwards, our 12-member group The Motley Madrigals was booking shows at Tahoe and Northern California faires. We added slapstick Shakespearean riffs to elegantly lovely vocal harmonies, and audiences responded. 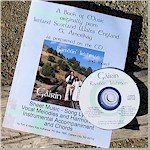 Our first CDs started as promotional items, for sending to event directors to prove we would sing in tune, but then the CDs sold well at events and online, so we kept recording. But when Mary Kay started getting into playing the accordion, the Ren Faires were no longer a fit. That's because the accordion wasn't invented until about 300 years after the Renaissance! 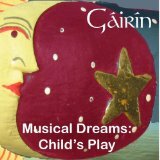 So, our focus turned to Celtic Music, with a change of name from the Motlies to Gairin, a Gaelic mashup meaning "a wee bit-o laughter" or "table margarine," depending on which Irish source you consult! 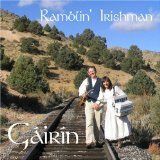 Within a month of forming Gairin, we found ourselves on stage at the Reno Celtic Celebration, backing up the famous Seamus Kennedy and Tempest! We also love to play! And fast! 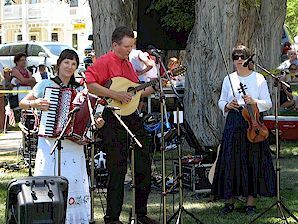 Our "Local Honey Band" with the fantastic and popular fiddler Bob Kastelic, and other local musicians, played contra dances in Northern Nevada and California. 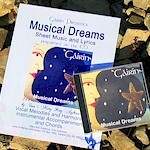 So now, here we are with five albums, two music books, arrangements and sheet music for sale on Sheet Music Plus, and our music licensed by film and radio through Getty. Lately, we have branched out to a wide variety of popular favorites, from Motown to Bowie. 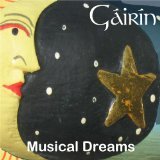 It's Out-of-Band music on folk instruments and with blended vocals. 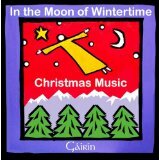 So, we've come a long way since our days doing choral work, singing as Amahl (Mary Kay) and Caspar the King (Tom) for Tahoe Choir, in a performance reviewed as "the best Amahl ever, no kidding!" At the time my voice was quite boyish, and we had an unbelievable cast, even though it was a community production at the local Catholic Church and the Tahoe Community College. We also got our singing chops with University of Nevada Reno Choir and Carson Chamber Singers, an elite group that is part of the Carson Symphony. We credit traditional music lessons and also two unlikely performers who have had a great influence on our success. "I was fortunate that Katharine DeBoer, world class classical vocalist and head of the University of Nevada Reno Vocal Department taught me how to find my voice," says Mary Kay. Tom also likes to credit veteran carnival performers Bill the Magician and Spike the Fire Juggler, "They reminded us that any 'act' is ultimately all about connecting with people. We have always been serious about making beautiful music; however, going on stage as "characters" sometimes allows us to connect better with more audiences. Wherever we perform,we find a way to engage the audience and select musical moods that connect and entertain. We have done a little teaching. In 2014, we started the Tuneville Session Players at the request of the Brewery Arts Center Chairman of the Board in Carson City, Nevada. From 2006 - 2011, we were instructors helping out our fantastic violinist friend Sue Jesch with the Carson City Symphony Strings in the Schools program, working with 60-80 music students of all ages from grade school through retirement age. 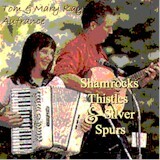 Mary Kay developed a workshop that got the students to form their own Celtic bands. All the bands performed as their grand finale. So, ten new Celtic bands debuted that day! Each band was featured during the crowd-pleasing performance for friends and family. Mary Kay is particularly proud of her most recent 80-year old accordion student, who reached his ambitious goal of learning to play Lady of Spain at the Cotati Accordion Festival! Since this particular student was a famous carver of cowboy caricatures, he suprised her with his thank you - one of his original wood carvings depicting Mary Kay playing cowboy accordion as Minnie of our duo Slim and Minnie. Read our reviews. . .